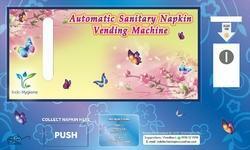 We are reliable Exporter and Supplier of the Automatic Sanitary Napkin Vending Machines from India. Appreciated for their long life and hassle-free operations, these Automatic Sanitary Napkin Vending Machines consume less power. The Automatic Sanitary Napkin Vending Machines, which we provide, are checked against diverse quality parameters prior to their delivery. 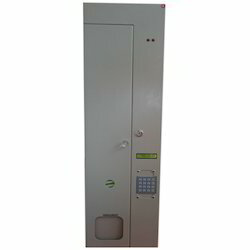 Sanitary Napkin Vending Machine IH-2CS is an Automatic Self-Service Vending Machine used for dispensing Sanitary Napkins against acceptance of Coins. 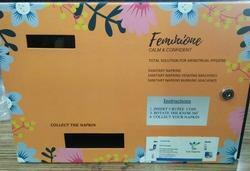 The Machine is configured to dispense Sanitary Napkins through a reliable motorized spiral mechanism. Coin Validator to accept coins of all denomination with an acceptable speed of 3 Coins/Second. The Coin Validator accepts the coins through a single slot entry for multi-coin operation. This machine is configured with 2 Product selections in 2 Trays arrangement with support. The Standard Single Napkin Polypacks holding capacity is 40-50 Numbers in this machine. The capacity depends on the size of the product. 2-Selection Keypad is provided for product selection. Upon selection of the product, Machine displays the selected product value and prompts the user to insert Coins one by one into the coin validator. Dispenses the selected product upon receipt of the exact value by any combination of Coins. Audible Buzzer provides beep sound alerts during transactions and a “Thank You” message is displayed at the end of each successful transaction. 2-Selection Keypad is provided for product selection. When configured for a single selection operation, this keypad is disabled. In Single Selection Model, no keypad is available in the front panel. 2 line LCD with Blue backlight and white characters for better visibility and to display messages to the user like product selection, its price, transaction status and Stock out Condition. Single slot entry for inserting all denominations of coins one by one. Product price is settable on-site with protected access to settings mode. Inbuilt self-test function for the dispensing motors. Smart acceptance feature enables the user to pay the product value by several combinations of coins. No excess value is accepted. Main Electronics Controller PCB incorporates the latest RISC Microcontroller technology. Industrial grade components are used in PCB to withstand temperatures up to 85 Degrees Centigrade. Compact design achieved with Surface mount electronic parts. Switch Mode Power Supplies (SMPS) are configured for soft start and stop operations. Battery Back-up with 12V, 7Ah battery during mains power failure and a built-in charger to charge the battery when mains on. Power Supply: 150V to 230V AC, 50Hz, 15W. 1.6 mm MS - Powder Coated Metal enclosure. Tamper-proof secure Locks with tubular keys. No keyholes. Looking for Sanitary Pads Vending Machines ?